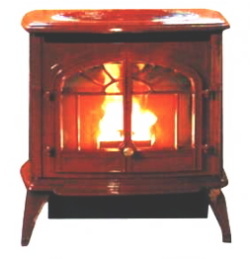 The Enviro Empress pellet stove used to be known as the Enviro Windsor, but has been upgraded internally. It's a cast iron stove that appears more like a woodburner than a pellet stove. The cast iron doors open revealing a large viewing window to further enhance this look. Inside is a set of cast iron brick effect liners. This stove is available in eight different attractive colours, making it possible to enhance almost any interior design. The auger mounting has been improved for both rigidity and quiet operation by adding both top and bottom bearings. The convection fan is variable speed and quiet running. For even more peaceful operation the exhaust and combustion fan can be moved outside the building. Window Size 16in. by 10in. Limited Lifetime Original purchaser. Covers the body of the insert or stove against material or workmanship defects for parts repair or replacement for seven years, labour for two years. Firebox, Heat Exchanger, Burn Pot, Firebox Panels, Ceramic Glass, Pedestals, Panels, Legs, Log Sets and Door Assembly. Limited Three Year Warranty: Burn pot liner. Limited Two Year Warranty: Igniter, Auger Motor, Circuit Board, Timers, Temp Sensors, Blowers, Vacuum Switch and Wire Harness. Limited One Year Warranty: Exterior surface finishes against defects in materials and workmanship. The convection fan in the enviro empress, which produces 105cfm. seems a little small for a stove of this output. Inspect burn pot, clean the burn pot liner, clean out air holes. Check the door latch, making sure it closes securely. Clean the window glass as needed. Check the ash pan and the door gaskets, re-glue if necessary. Empty the ash pan and operate the heat exchanger cleaning rod. Make sure that the fresh air intake is clear. Remove the brick liners and clean the back of the stove. Check and clean the exhaust vent every year or after burning two tons of pellets. Vacuum dust from the blowers. If you would like to leave a review of the Enviro Empress, please use the form on the contact page.